One of the best things about winter is getting cozy in a comfortable turtleneck sweater. For some women, turtlenecks are a winter essential, not only because they keep you warm, but many styles are very stylish and elegant, so you look great as well. 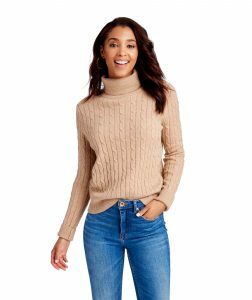 From oversized to fitted styles that work for the office in cotton, cashmere, viscose or alpaca, we have rounded up all kinds of options to help you find a go-to turtleneck that will get you through the coldest winter days. Madewell’s Inland Rolled Turtleneck Sweater is a great style to start our list. It is a super soft, oversized style made from wool and alpaca. If you are looking for cozy, this may well be the sweater for you. It has a nice fit that isn’t too loose nor too fitted. The Inland is relatively lightweight, but it still manages to be warm because of the fiber mix. The alpaca makes the wool softer and more accessible to wear than just straight wool. The actual neck part of the sweater is reasonably small with a loose fit to it, so it isn’t super tight around your neck. You can dress the Inland up or down, so it’s also really versatile. Depending on the sizing you go for, it probably won’t fully cover your behind if you are considering this style to wear with leggings. If you go with standard sizing, it tends to fall around the hip area. 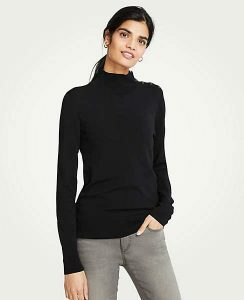 Ann Taylor has some essential work turtlenecks that will keep you looking chic and professional, while also staying nice and warm as you go about your workday. Ann Taylor sweaters are perfect if you need a polished, high-end look without spending hundreds of dollars to achieve that look. Their styles aren’t super cheap, but they tend to wear very well, so you can invest in a piece and wear it year after year. The turtleneck pictured above comes in five primary colors and has an attractive button detailing on the shoulder. The neck, cuff and the hem are ribbed, and it is a tailored fit. It is primarily made from viscose and nylon, with a little bit of spandex, so the material is quite soft and pleasant to wear. The material is warm but relatively thin, so it also works well under a blazer or possibly a cardigan. Free People is a great brand to get a soft, warm sweater from. Their Stormy Pullover is a cozy, modern cropped style that manages to look flattering while still being oversized and comfy. The neck has a fair amount of fabric to it, so it will keep your neck warm if you wear it outside. 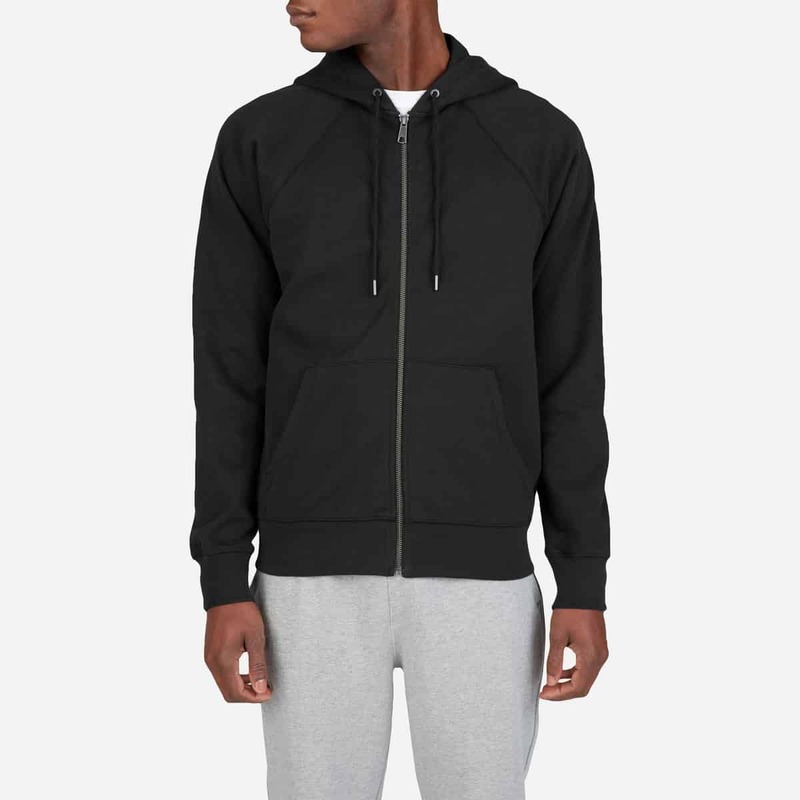 The best feature of this sweater is the softness of the material, it is a mostly nylon, polyester and wool blend, with a bit of alpaca and spandex thrown in. The nylon and the alpaca are what makes it soft, and the polyester and wool are what makes it warm. Since this sweater is cropped, this is a style that looks great with high-waisted pants. 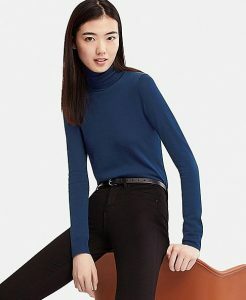 Uniqlo has a great selection of turtlenecks, especially if you are looking for a garment for layering, as most of their styles tend to be very fitted. 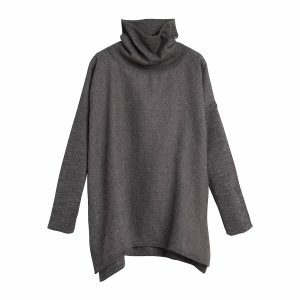 Uniqlo sweater has a reputation for being warm, soft and very flattering for most body types. They are also easy to care for since they are generally machine washable. If you aren’t familiar with merino wool, it is very soft wool that is known for not being itchy. Since Merino is wool, it is excellent at retaining warmth and has the insulating properties that you would find in regular wool without the discomfort that you can sometimes get. Most women who get buy this Uniqlo design find that the quality and the price are very good for what you are getting. 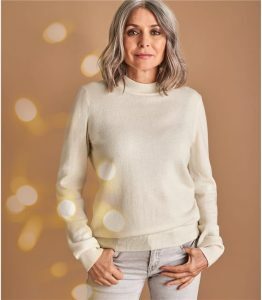 For those women who are looking for a good quality, reasonably priced wool sweaters with a less fitted look to it, you should check out Woolovers. The key selling point of this brand is the prices are very reasonable for the high-quality natural fibers that you are getting. 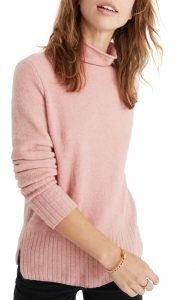 Their turtleneck styles change from year to year, with their latest being a cashmere and merino blend, so it is going to be soft and lightweight, yet very warm. It comes in eight beautiful colors to choose from. This style is more of a mock neck than a full turtleneck, but mock necks are lovely because they give you a lot of warmth without the fold over than can sometimes be a little bit too much on some styles. The Everlane Cashmere Turtleneck is a trendy, basic style that works well with most body types. The cashmere quality is reportedly very soft and high quality, so it is comfortable to wear even without an underlayer. If you stick to the standard sizing, the fit will be a tiny bit roomy, but that helps add to the comfort. It comes in many different colors, so there is something for everyone. If you are looking for a cashmere staple that you can dress up or down, Everlane is an excellent place to start. This L.L Bean turtleneck is an exciting combination of cotton with a little bit of cashmere thrown in. It isn’t always the easiest to find a cotton sweater, so this style is very popular for women who dislike wearing pure wool. Since this sweater is primarily cotton, it means that it is going to be nice and soft while still being reasonably durable. It is also a jersey knit, so that helps to make it even smoother. You can put this turtleneck right into the wash, no need for dry cleaning or hand washing here. It has a slightly fitted shape so that you can wear it on its own or as a layering piece. It doesn’t come in the broadest range of colors, but you can get it in most of the basics. If you are looking for moderately priced, good quality cashmere, you are going to want to check out Naadam. The company deals directly with herders who raise the goats for the cashmere, so they can get a reasonable price that they, in turn, pass onto the consumer. The turtleneck pictured is a cashmere and wool blend, so it is going to be super soft. They have a few different turtleneck styles that all look very comfy. The colors are a little bit limited on some of their designs, but they have the standard colors that will suit most women. 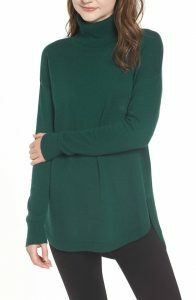 A comfy style that works well if you are looking for a turtleneck that you can wear with leggings is the Turtleneck Sweater from CHELSEA28. It is another option that has cotton with a touch of cashmere, and also viscose and nylon in the material mix. The curved hem is super flattering with leggings, as it will cover your behind and give a flattering fit. This design does have to be hand washed, so be aware of that if you are interested in purchasing it. A style that looks great with leggings is this v28 Sweater that is a popular option on Amazon. It is made from viscose and nylon, which means the sweater has a silky feel to it. It is reportedly very high quality, and the length is very long, so it can conveniently cover any of those areas that you would prefer to not draw attention to. Most reviews say that this sweater is really warm and thick, while still being soft and comfortable. It also is reportedly washes really well without any color fade, which is unusual for such an inexpensive sweater. Vineyard Vines specializes in preppy, classic styles, so they are an excellent place to get basic wardrobe staples like luxury turtlenecks. They sell a beautiful 100% cashmere traditional cable knit patterned design that can easily be dressed up or down. The cashmere is super soft and high quality, and it can be hand washed. Vineyard Vines can be pretty pricey, but their sweaters are nicely made and should last for years with minimal pilling.